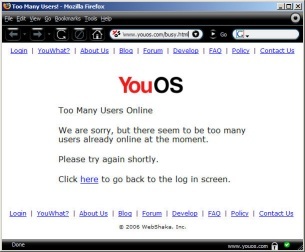 YouOS is being billed as a web operating system (albeit one that's currently in Alpha). It's a promising glimpse of the direction that OSes are likely to head in the near future; essentially, you start up your web browser and point it at youos.com, login, and the browser becomes your "Windows-a-like" desktop. From there you can run Ajax applications like word processors and spreadsheets. The potential of YouOS is huge: simply launch a web browser, login, do some work, logout, login on a different machine, and see the exact same desktop appear - plus your saved work, I hope. It has the potential to make Windows (or any other heavyweight desktop OS, even (gasp) Ubuntu Linux, OSX etc) obsolete - something that NetScape, back in their most headstrong days, briefly tried and failed to do. Of course, back then they didn't have Ajax (although I'm convinced it was the awful brown color scheme that killed off NetScape's attempt at a web OS before it even lurched away from the starting line). When I excitedly tried out the YouOS demo, the above screenshot appeared. And this crystallized a nagging doubt that had been pecking away in the back of my head. The danger with an on-line OS - i.e. one where the applications and the data are stored remotely - is that the single biggest point of failure is going to be the most unreliable part, the network. (And it's the single most insecure part, for that matter). Of course, in the above example, it's that the YouOS servers are overloaded, probably due to an explosion of interest in an exciting new product. And we must give them leeway because this is only an alpha version. But for me, it still provides a depressing glimpse into the new set of issues that will plague our next generation of OS desktops. A few years ago, the Windows Blue Screen of Death (BSoD) was the running joke about OS reliability. Very soon, the running joke is likely to be the "We're busy, try again later" web page.